Preheat the oven to 160°C. Blend 1 cup of nuts at a time in a food processor or blender until coarsely chopped. Mix with the butter and 2 T xylitol. Press into a greased 20 cm spring-form tart tin and chill for 1 hour. 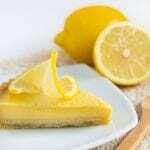 To make the filling, whisk together the eggs, egg yolks, cream, lemon juice and remaining xylitol. Slowly pour into the crust and bake for 30 minutes. Cool and chill until set. Slice and serve with double-thick cream, just because you can!